The Embraer ERJ 190-100 is a twin-engine medium-range jet airliner for up to 114 passengers. Embraer, the Empresa Brasileira de Aeronáutica S.A., is a Brazilian corporation, founded in 1969. Embraer was a nearly bankrupt concern when it was restructured and privatised in 1995. Today it is one of the largest aviation manufacturers in the world, producing regional commercial, military, and corporate aircraft. In the mid-1990s, Embraer entered the short-haul feeder-liner jet market with the Embraer EMB145, renamed ERJ-145 EMBRAER Regional Jet since. In 1996, Embraer began studies on a new regional jet in the 70/90-seat category, based on the successful ERJ-145 concept, and approached 46 regional airlines and performed in-depth investigations on trends in North America, Europe and Asia. In 1997, these studies led to a new concept for the jet liner. On 11 February 1999, Embraer announced the "pre-launch" of the programme to develop the new airliner for the 61-80 seat niche. The definitive launch of the E-170/190 project was announced at the Paris Air Show in June 1999, with as launch customers for the aircraft Régional Compagnie Aérienne Européenne, France, with ten orders and five options for the E-170; and the Swiss airline Crossair with an order for 30 E-170s and 30 E-190s. The prototype ERJ-170, c/n 17000001, registered PP-XJE, flew first on 19 February 2002. The Embraer E-Jets line is composed of two main commercial families and a business jet variant. The 170 and 175 share 95% commonality, as do the 190 and 195. The two families share near 89% commonality, with identical fuselage cross-sections and avionics, featuring the Honeywell Primus Epic EFIS suite. The E-170/E-175 models in the 80-seat range are the smaller in the E-Jet family. They are powered with General Electric CF34-8E engines of 14,200 lbs (62.28 kN) thrust each. The E-190/195 models are a larger stretch of the E-170/175 models fitted with a new, larger wing and landing gear structure, larger horizontal stabilizer and a new engine, the GE CF34-10E, rated at 18,500 lbs (82.30 kN). The high performance, high efficiency General Electric CF34-8E and CF34-10E engines are very quiet and the aircraft meets and exceeds the noise and emission-related requirements established by the International Civil Aviation Organization (ICAO). The field performance enables the aircraft to operate efficiently at airports located in strategic places that present operational restrictions. The prototype ERJ-190, c/n 19000001, registered PP-XMA, flew first on 12 March 2004. Although generally known with simply an "E" prefix, the jets are technically still Embraer Regional Jets ("ERJ"s). Embraer dropped the ERJ prefix in its advertising and replaced it with simply an "E" for market reasons. The E-Jets Family is produced in São José dos Campos, Brazil. Today, over 1000 Embraer E-Jet family aircraft have been delivered to operators all over the world. In the beginning of 2013, Jetairfly was the first holiday airline worldwide to introduce the Embraer E-Jet 190 in its fleet. The 2013-built Embraer ERJ 190-100STD c/n 19000607 was testflown as PT-TJM and was registered OO-JEB in Belgium with TUI Airlines Belgium, Zaventem, on 6 March 2013. TUI Airlines Belgium is trading as Jetairfly. The Jetairfly 'E-jets' are painted in the TUI Travel "Dolphin Wave" colours with Jetairfly titles. The OO-JEB was delivered at Brussels-Zaventem Airport on 15 March 2013. Embraer ERJ 190-100STD OO-JEB is the second aircraft of this type operated by Jetairfly and was named "Navigator". 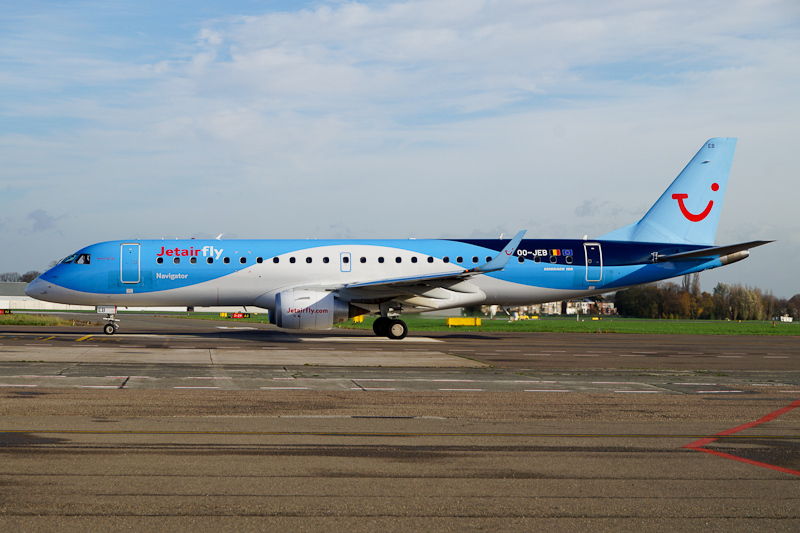 On 13 November 2015, the Jetairfly' Embraer ERJ 190-100STD OO-JEB "Navigator" was seen at Antwerp Airport.